Every Thursday, Bespoke publishes its “Bespoke 50” list of top growth stocks in the Russell 3,000. Our “Bespoke 50” portfolio is made up of the 50 stocks that fit a proprietary growth screen that we created a number of years ago. Since inception in early 2012, the “Bespoke 50” has beaten the S&P 500 by 102.9 percentage points. Through today, the “Bespoke 50” is up 213.1% since inception versus the S&P 500’s gain of 110.2%. Always remember, though, that past performance is no guarantee of future returns. Every Thursday, Bespoke publishes its “Bespoke 50” list of top growth stocks in the Russell 3,000. Our “Bespoke 50” portfolio is made up of the 50 stocks that fit a proprietary growth screen that we created a number of years ago. Since inception in early 2012, the “Bespoke 50” has beaten the S&P 500 by 107.2 percentage points. Through today, the “Bespoke 50” is up 216.5% since inception versus the S&P 500’s gain of 109.3%. Always remember, though, that past performance is no guarantee of future returns. Every Thursday, Bespoke publishes its “Bespoke 50” list of top growth stocks in the Russell 3,000. Our “Bespoke 50” portfolio is made up of the 50 stocks that fit a proprietary growth screen that we created a number of years ago. Since inception in early 2012, the “Bespoke 50” has beaten the S&P 500 by 100.8 percentage points. Through today, the “Bespoke 50” is up 204.3% since inception versus the S&P 500’s gain of 103.5%. Always remember, though, that past performance is no guarantee of future returns. Every Thursday, Bespoke publishes its “Bespoke 50” list of top growth stocks in the Russell 3,000. Our “Bespoke 50” portfolio is made up of the 50 stocks that fit a proprietary growth screen that we created a number of years ago. 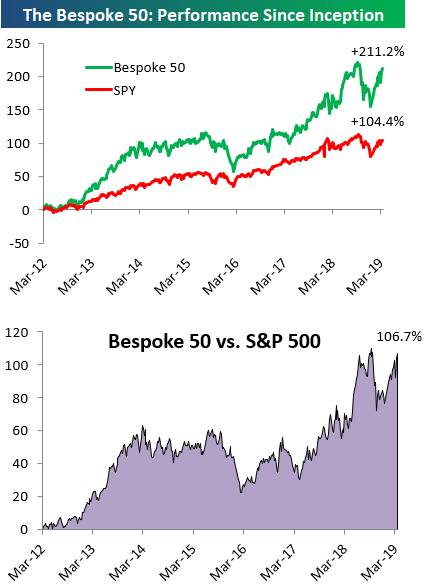 Since inception in early 2012, the “Bespoke 50” has beaten the S&P 500 by 106.7 percentage points. Through today, the “Bespoke 50” is up 211.2% since inception versus the S&P 500’s gain of 104.4%. Always remember, though, that past performance is no guarantee of future returns. Every Thursday, Bespoke publishes its “Bespoke 50” list of top growth stocks in the Russell 3,000. Our “Bespoke 50” portfolio is made up of the 50 stocks that fit a proprietary growth screen that we created a number of years ago. Since inception in early 2012, the “Bespoke 50” has beaten the S&P 500 by 100.9 percentage points. Through today, the “Bespoke 50” is up 205.2% since inception versus the S&P 500’s gain of 104.3%. Always remember, though, that past performance is no guarantee of future returns.